San Francisco’s favorite family picnic is back for 2019. Presidio Picnic brings together the best of the Bay Area food scene with the beauty of this national park site and views of the bay and the Golden Gate Bridge. Held on the seven acre Main Parade Ground lawn, this weekly community event features food and drink from more than 30+ international mobile food creators representing the best of San Francisco’s multicultural food scene curated by Off the Grid. 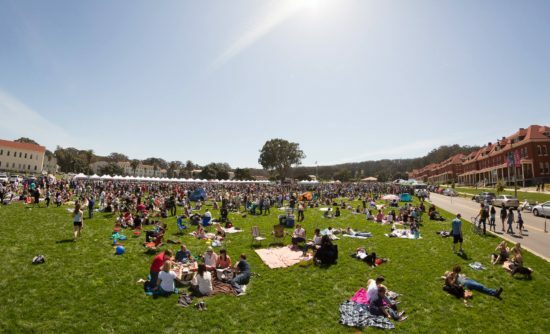 But it’s not just about the grub; visitors can enjoy an ever-changing array of free activities including yoga classes, lawn games, a Presidio photo booth, free kids bike-riding lessons from the Presidio YMCA, and nature-based arts and crafts for kids in the Presidio Adventure Zone tent. Grab a blanket and head to your national park for Presidio Picnic. This great family event takes place on the Presidio’s beautiful Main Parade Ground, a seven-acre lawn with views of the park, the city, and the San Francisco Bay. Cultural Dance Performance every 3rd Sunday of the month at noon to 2 pm.